PFB0595w is localized to the parasite cytosol. (A) Immunolocalization of PFB0595w using the anti-PFB0595w antibody on fixed P. falciparum 3D7-infected erythrocytes stained with Hoechst 33258 (to visualize the nucleus) BF, bright field. (B) Localization of the GFP signal through live cell imaging of PFB0595w-GFP transfectants stained with Hoechst 33528. DIC, differential interference contrast; Merge, PFB0595w-GFP plus Hoechst 33258 channel; Overlay, DIC plus merge. (C) Indirect immunofluorescence localization of GFP and PfHsp70-1 in PFB0595w-GFP transfectants using the anti-PfHsp70-1 antibody. Merge, anti-PfHsp70-1 plus PFB0595w-GFP and Hoechst 33258;Overlay, DIC plus merge.Njunge JM, Mandal P, Przyborski JM, Boshoff A, Pesce ER, Blatch GL. 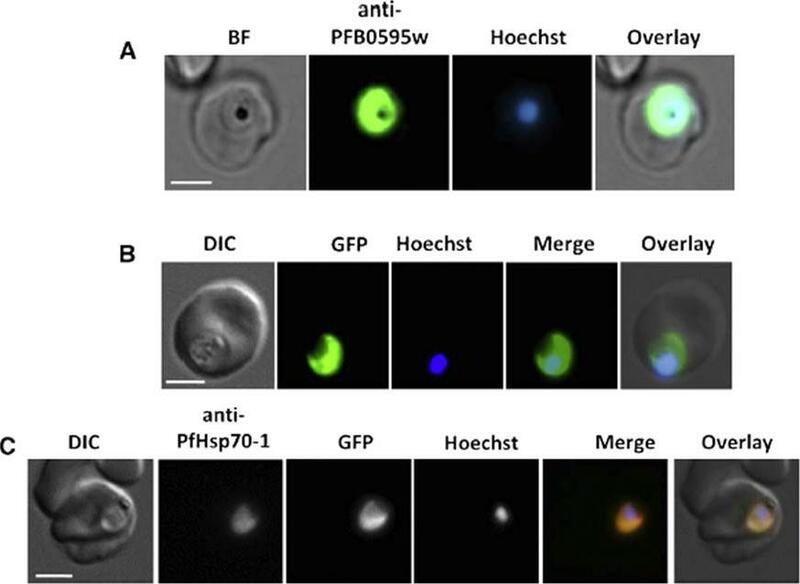 PFB0595w is a Plasmodium falciparum J protein that co-localizes with PfHsp70-1 and can stimulate its in vitro ATP hydrolysis activity. Int J Biochem Cell Biol. 2015 62:47-53.